English Cinema in Venice, Italy is a bit harder to come by than the likes of Rome and Florence, in fact, movie theaters in Venice, Italy are not plentiful. However, it’s not completely lacking, you just have to know what to look for. When checking movie times, make sure to look for “v.o.” or versione originale (original version) which means the movie is playing in the language it was made in. Showing the latest in movies in the center of Venice. Here you won’t find any movies in English as they mainly play movies by Italian writers. This one screen movie theatre is for the movie enthusiasts. This is the location of the famous Venice International Film Festival every year and well worth the visit. This isn’t your typical cinema, but worth the visit to see. Click on the link above to see if there are any events there while you are in town. 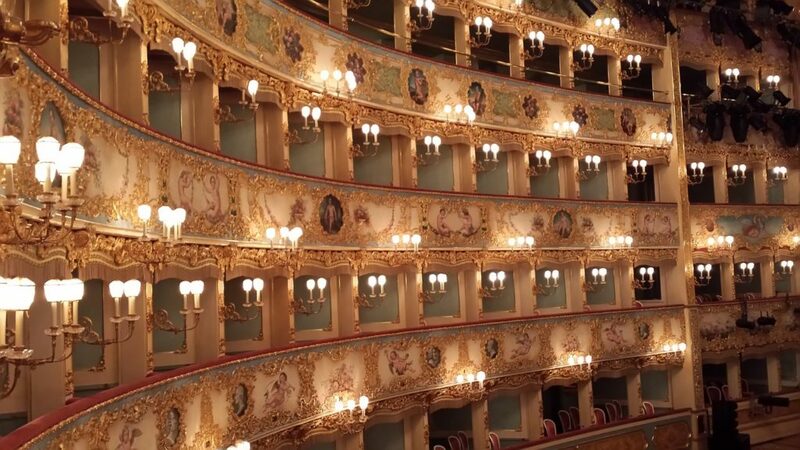 Venice is home to some of the most beautiful opera houses in Italy, each still open and running. Another venice theatre in the city center near the Rialto Bridge, showing a range of plays, dances, concerts, and even children’s theatre. Unfortunately for our partiers/dancers there aren’t many options for dance clubs in Venice, Italy. Venice is more of a cocktail bar/aperitivo style kind of city. You can check out our other page for a list of wine and cocktail bars in Venice for a more relaxed (but fun) night out. Not your typical dance club, however, it is one of the best clubs in Venice, Italy as far as jazz club with live music goes and well worth the visit. They are closed Thursdays and Sundays and the entire months of August, December and January, so we are sorry if that’s when you were planning on visiting. They also serve dinner for those that are staying for the concerts that begin at 9PM. Highly suggested to book a table in advance. Again, don’t be fooled by the word “club,” as there will be no 3 AM dancing at this restaurant/bar but you will be blown away by its menu, its cocktails and its amazing view of San Marco Square. A terrace on the water at the Hotel Cipriani that will not disappoint. Self proclaimed as the only disco in Venice. What once started as a gallery in ‘63, was shortly redesigned to be a dance club in Venice. Here you can dance the night away from Wednesday-Saturday 11PM-4AM. Dress to impress!